Cascadia Capital Advises Travis CI in Acquisition by Idera, Inc.
Cascadia Capital, an investment bank serving middle market clients globally, today announced it acted as the exclusive financial advisor to Travis CI, a market leader in continuous integration, by Idera, Inc., a global B2B software productivity brand. 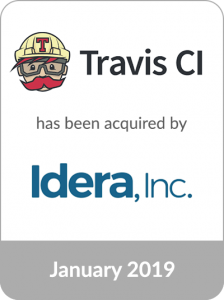 Travis CI will join Idera, Inc.’s Testing Tools division, which also includes TestRail, Ranorex and Kiuwan. Travis CI is a continuous integration platform used by more than 700,000 developers worldwide to build and test software applications. Travis CI integrates with most other tools in the software development lifecycle, making the platform extremely popular with developers and highly complementary to Idera’s Developer and Testing Tools offerings. Founded in 2011 and headquartered in Berlin, Travis CI is a respected leader in the open source community and provides commercial options for customers looking for enhanced features, performance and support. The Company’s customers include IBM, Schibsted and Zendesk. The acquisition represents another successful transaction for Cascadia in the DevOps technology sector. Past transactions include the acquisitions of Scout Server Monitoring and Papertrail.